The rush of the Mambova Rapids casts a soft blanket of sound over Impalila Island Lodge. Nestled close to the junction of four countries - Namibia, Botswana, Zambia and Zimbabwe - and near the meeting place of the mighty Zambezi and Chobe Rivers, Impalila Island Lodge is a water-bound wonderland. With over 100km of waterways to traverse, Impalila lies a mere 80km upriver from the Victoria Falls. 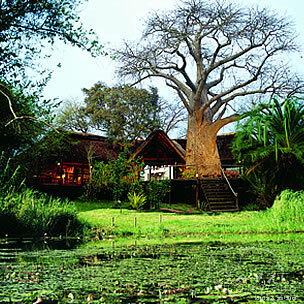 Surrounded by rippling beds of pink-tinged water lilies, the lodge lies protectively beneath the branches of a 700 year-old Baobab tree under which, it is said, David Livingstone camped. Eight luxury en-suite chalets all with river views echo the colours of Africa. Here lies promise of excitement by day; tranquillity by night. Light arching through long-stemmed wine glasses throws colour onto crisp linen. An attentive team produces culinary art, and mealtimes become a ritual of their own. Our seductive rivers invite you to explore further. 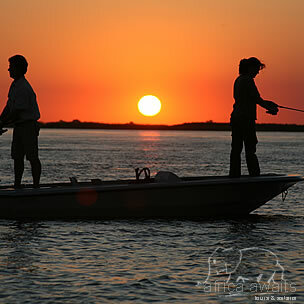 Encounter Africa's big game and birdlife by boat or challenge the legendary tigerfish on fly. Follow the island's footpaths for an intriguing village visit and learn of the medicinal uses of the indigenous plant life. This tour departs daily from Kasane, Botswana to Victoria Falls. Clients will be transferred to the Kazungula border where their tour guide will meet them. En route to the Victoria Falls, clients may be taken past the 'Big Tree' where they may stop and take photos. Clients will be accompanied through the Rain Forest by a qualified Wild Horizons guide, who will give a brief history of the Falls, as well as describing the flora, fauna, bird & wildlife and other points of interest. The tour includes a visit to the market and an opportunity to shop at the open air curio market and shops for souvenirs and gifts. At 12H30 visitors then enjoy lunch, which, depending on the number of guests booked will either be a Lunch Cruise or lunch at a hotel. Thereafter, the Zambezi Nature Sanctuary and Crocodile Ranch is visited. This provides a unique insight into the Zambezi crocodile's life and the sanctuary is also home to a variety of wild animals, including lion and leopard. Clients are then returned to the Kazungula border where they will be met by their Botswana guide for their return transfer to their hotel in Kasane, arriving at approximately 15H30. Anti-malaria tablets are advisable all year round. We recommend you check with your physician for prophylaxis advice. Mosquito repellent sprays are provided, and we recommend that long sleeves and pants be worn in the evenings and early mornings. The Zambezi River at Impalila island i.e. about 80 kilometres above the Victoria Falls is a famous and extremely productive fishing destination for fishers from around the world intent on locking horns with the awesome tiger fish (Hydrocynus vittatus). In addition to approximately 40 kilometres of the Zambezi itself, the lodge has immediate access to waterways such as the Kasai Channel, the Indibi and the Chobe River itself. Impalila Lodge lies on the fourth channel of the Mambova Rapids (Zambezi River) and this can be fished effectively after the river levels have dropped from September onwards. All of these waters provide excellent conditions to come to grips with tigerfish and specimens of up to 20 lbs. have been caught in the adjacent waters over the last few years. Each season sees a mammoth specimen of 17 - 18 lb. being taken by the lodge boats. From 2007, good floods have meant excellent catches and in the 2008 Tiger Quests some 15 tigerfish of over 10 lbs were landed on fly. However, the more usual catch is for tigers of between 2 - 6 lbs. The tiger fish is renowned for its escape tactics and it is often said that only one out of ten tigers hooked is ever landed. It is not only the magnificent 'striped water dog' that lures anglers from far and wide but also the beautiful nembwe - the olive bream - that grows up to 7 lbs. In addition incidental captures may include thinface and humpback largemouths, pink happies (bream), threespot tilapia, and the ubiquitous catfish. The catfish, also known as 'barbel' in Southern Africa, grows over 20 lbs and is a reasonably common catch. Impalila Lodge has been at the forefront of exploiting the wonderful potential for the flyfisher, as the tiger takes a fly ferociously. Traditionally, conventional fishing with artificial lure or bait, have been a popular mode of pursuit for the tigerfish. Indeed, for any angler, the surrounding waters provides for world-class fly fishing for tiger fish on one's doorstep. Double figure fish are a distinct possibility in the good months. Tigerfish can be caught all year round, but the fly/lure period is generally regarded as being from June - November. This is after the annual floods (January - April) have begun to recede. During the 'season' - there is no closed period - the river levels drop, providing various challenges as the conditions change e.g. the catfish congregations, floodplains fishing and rapids fishing. This is fly fishing at its most exciting. The eastern tip of the Caprivi Strip is a veritable bird watchers' paradise and few guests fail to be impressed by the variety of bird life that greet one almost incidentally from dawn to dusk - the call of the Heuglin's robin at morning coffee, the Yellow-bellied bul-buls at breakfast and the sight of evening flights of the Yellow-billed storks to their nesting places on the Chobe. During the day, one will invariably see the unforgettable Fish eagle perched high in a tree along the river's edge, watch the controlled hover of the Pied kingfisher or marvel at the jewel-like flight of the Malachite. Indeed, for all visitors, it becomes a question of how many different species one will be able to 'tick off' during your stay, for there are over 450 species occurring here - including some of Africa's rarest species. The area attracts many migrants and the variety of habitats offer specials such as Pels fishing owl, Rock pratincole, African skimmers and Pygmy geese. The best time to visit the area is our summer, from November to April, when most of the migrant species are present and resident species are in breeding plumage. The backwaters, channels and grasslands of the floodplains include a wide variety of wetland birds, including herons, storks, ibis, wildfowl and crakes. Early morning is the best time to search for Black and Coppery-tailed coucals as they sit sunning themselves. Impalila Island is one of Namibia's top birding venues. In close proximity to prime grasslands, temporary wetlands, seasonal floodplains, densely wooded islands and open water habitats, it is little wonder that such a bounty has been recorded in the area and all Okavango specials can be seen here. For the serious birder, other rare sightings include the Olive woodpecker, Schalow's turaco, the Emerald cuckoo, River warbler and Half-collared kingfishers. We offer bird viewing either on foot or by boat. Visitors with a special birding interest should mention this when making their reservation. 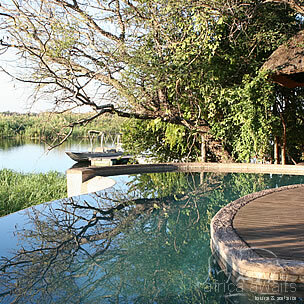 A highlight of any stay at Impalila lodge is a game cruise - or two - into the famous Chobe National Park. Depending on the time of the year, our staff will advise on the prime time to take a cruise, though it is usually best to consider mid-afternoon when the game come down to drink. While elephants, crocodiles and hippos are all sometimes spied in the Kasai channel on the way to the Chobe, the National Park is no more than a 45 minute cruise from the lodge. It is renowned for spectacular experiences with large numbers of elephants at close range. Often when the river levels drop, visitors are treated to sightings of these magnificent creatures swimming across the river. The Chobe bank is also famous for buffalo, Chobe bushbuck, puku, hippo, crocodile and Roan antelope. Less frequent, but a distinct possibility, may be a sighting of lion. The Chobe game cruise is an outstanding experience for all visitors and especially for those keen on their photography. No half-sightings here, for it is more likely from the waterside that some incredible close-rnage photographs can be taken. A game drive into the Chobe National Park (exclusive activity) can also be arranged for a morning. Visitors do need to enter Botswana officially for this outing. Lunch may also be included. Impalila Island has a varied flora but is rich in history and the guided walks around the island offer a closer insight into the background of the area as well as the life of the local people. These morning or afternoon walks may also include a visit to a 2000 year-old baobab tree on the island. From its lofty heights all four surrounding countries (Botswana, Zambia, Zimbabwe and Namibia) can be viewed as well as the confluence of the Zambezi and Chobe Rivers. For those interested in the culture of the island, the chosen outing may include a visit to a nearby village or centre around an Afro-botanical outing, which provides a fascinating insight into the traditional medicinal uses of plants and trees in the area. No matter whether you have spent your day fishing for tigers, enjoying a wonderful variety of bird life, seen the elephants grazing on the bank behind you or simply relaxed by the pool, there is little to beat a quiet sunset cruise up the Zambezi past the village of Kalikaliga and to take time to reflect on yet another unbeatable African sunset - and an unforgettable Impalila visit. With your holiday, safari or business trip from in to Impalila Island Lodge in Namibia.